Untangle the complexity, see the results. No new solutions will be found using old methods. So, we custom build the business case, strategic roadmap and operational plan that brings it to life. we do this in a collaborative process designed to concurrently build the skills and confidence of your team. We help them accelerate decision making and validation, uncover new solutions and spot trends that create opportunities using our outside in perspectives. 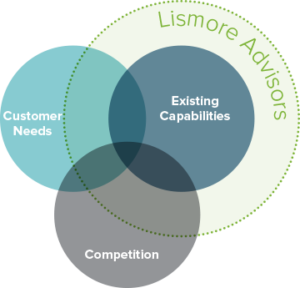 We also use our Advisor Network to build their exposure and capabilities. As business leaders, we know from experience that the confidence and competitive capabilities of your people are the real key to long-term profitable success. We refine the plan with the assistance of our Advisors, drawing on the experience of 400+ business experts to make sure we’ve covered everything. We run pilot programs, prototypes and tests to hone our approach for maximum market impact. Once we launch, we measure success of the program through revenue, EBITDA, cash flow, market share, enterprise value and an increase in business opportunities. We specialize in making sure you get the measurable results that matter for you and that you have access to expertise and the support you need while you’re getting them. Untangle complexity and see results!